Many cats that have been adopted from rescue centres and welfare organizations have been neutered and this eliminates the risk of unwanted kittens. Very occasionally an adopted cat may not have been neutered or a stray cat may have been adopted who is already pregnant and this can result in her giving birth to an unplanned litter of kittens. There are very few signs that indicate that a cat is pregnant. Often, the first that people are aware is when the female cat starts looking for somewhere to build her nest before giving birth. It is only at the very end of her pregnancy that her appearance will really start to alter. By this time there is little to be done other than to prepare for the new arrivals. Quality food – the mother cat should be given the best quality food available. This should be high in protein and other important nutrients. The feeding of her new litter will exhaust her energy and she will require good and regular food. Regular checking – the litter will need to be regularly checked to make sure that all of the kittens are feeding. Occasionally one of the litter will fail to keep up with his siblings and become malnourished. This little kitten may require supplementary feeding in order for him to develop. Bed and bedding – a nursing mother cat will require a bed that gives both her and her litter lots of protection and privacy. Occasionally the mother will move her kittens and she will do this if she feels threatened. Sometimes they move their family for no apparent reason and to the most unsuitable of places! Therefore a close eye needs to be kept on the new family to make sure that they are not moved anywhere that is unsafe or impractical. Check up with the vet – if the mother cat is from a rescue centre, a check up with the vet will be necessary. This is because there is likely to be little, if any, knowledge of her previous health records. It may not be known, for instance, whether she has had vaccinations, been treated for worms or other parasites or had a previous illness or injury. The vet will check the new family and make sure that they are all well and will also be able to advise on a health plan for the kitten's first few weeks of life. Burden on animal welfare organisations - unwanted cats and kittens are an added burden on welfare organisations. There are many cats looking for new homes and adding more cats to this number compounds the situation. Expense - kittens, whether planned or unplanned can be costly. 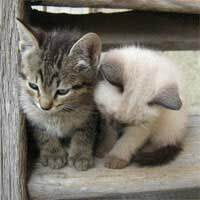 Even the most healthy kittens are likely to require veterinary attention which may include vaccinations. If the kittens are to be rehomed they will definitely require vaccinating. Challenge of rehoming unwanted kittens – there are many unwanted kittens and it can be difficult finding suitable homes. This can result in kittens being taken to an animal rescue centre. Time commitment – looking after kittens can be a surprising drain on time. They can be noisy and messy and without proper planning this can disrupt a household. Kittens can be great fun and easy to look after, however the resulting time commitment, expense and problems of finding them homes are very good reasons why safeguarding against unplanned pregnancies is so important.